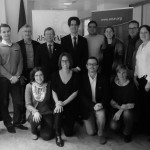 From 28th till 30th of April 2010 the Kick-off meeting of the ALL FOR SPORT FOR ALL Project was organised at the headquarters of the European Paralympic Committee (EPC) in Vienna, Austria. 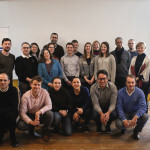 During three intense days of working, the Project Management Group together with all Partners (15 organisations from 12 EU countries), have agreed on the overall principles, strategies and working methodologies for the project. Major success of the meeting was to agree on the data collection methodology for mapping the status quo of the sector to then being able to contribute to better access to a wide network of opportunities in sport for people with a disability. Data collection will be conducted from June till August 2010 and first results are expected to be presented in October 2010. The “ALL FOR SPORT FOR ALL: Perspectives of Sport for People with a Disability in Europe” project is conjointly run by the European Observatoire of Sport and Employment (EOSE) and the European Paralympic Committee (EPC) from 01st of March 2010 till 28th of February 2011, and is funded within the Preparatory Action for Sport by the Sport Unit of the European Commission. Should you require any further information or if you are interested in collaborating in that European project as Associated Partner please do not hesitate in contacting our Secretariat.